Explanation: Where is Hale-Bopp now? The Great Comet of 1997, one of the largest and most active comets ever, is outbound about 400 million miles from the sun. Too faint for viewing without telescopes or binoculars, Hale-Bopp is presently positioned in the very southerly constellation of Pictor. This "negative" image (black stars against white sky) of Hale-Bopp is the result of a 1 hour time exposure using the 1-metre European Southern Observatory Schmidt telescope on January 5. 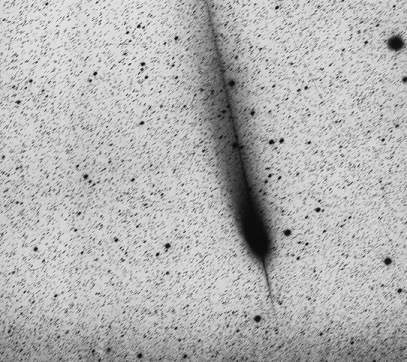 Clearly the comet still has a substantial tail, blown by the solar wind, that points generally away from the sunward direction. But look closely. A spiky "anti-tail" is also visible pointing toward the sun! 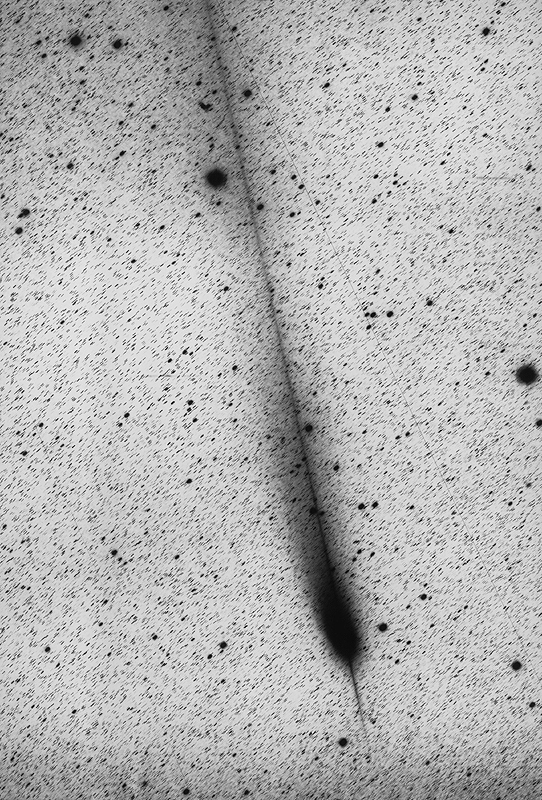 It is likely that this anti-tail is composed of dust grains released from the comet nucleus which are too large to be easily pushed by the solar wind. As Hale-Bopp recedes from the sun its activity will subside but astronomers are still uncertain as to how long its tails will last. After a swing through the outer solar system and the Oort cloud, Hale-Bopp will pass through the inner solar system again ... around the year 5400.